America likes imports on its highways: both the cars that travel them, as well as the road designs themselves. President Eisenhower created the interstate system in the 1950s after being inspired by Germany's autobahns. Roundabouts, long staples of England and Australia, now exist here in the thousands. 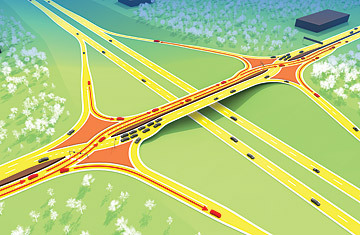 And the latest roadway innovation, known as the diverging diamond interchange, comes from France  zut alors!. The concept is confusing, but engineers see it as a simple way to fight congestion. "It sounds more complicated, and looks more complicated from the bird's eye, than when you're driving it," says Lee Hillner, a highway engineer who helped open a diverging diamond in St. Louis in October. ("This is either brilliant or bizarre  I can't decide which at this point," wrote a blogger that same month on an engineering website.) "The rush-hour backups have disappeared," he says. "There was a lot of concern because it's new and people drive on the left side of the road, but drivers have adapted very quickly." The Federal Highway Administration likes the math. It reports that what it calls "double crossover diamonds" can handle about 650 left turns per hour  twice that of a conventional interchange  while overall delays can be cut by up to 60%. The design doesn't work at every intersection, like those where most vehicles are going straight or where area is too limited for turns to be properly spaced. But where the model does work, traffic efficiency is just one of the perks. It can also be cheaper. The compact design allows engineers to increase traffic flow by changing the way they use existing space rather than turning to the costly addition of extra lanes. "What makes it the next big thing is it's an inexpensive option," says Don Saiko, project manager for the nation's first diverging diamond, which opened in Springfield, Mo., in 2009. The original plan for expanding that intersection was set to cost $10 million, but the diverging diamond ended up costing only $3.2 million. Hillner's project, estimated to cost $23 million for a traditional design, came in at $10 million once the diamond design was chosen. "Literally, these diverging diamond interchanges could save the country billions of dollars," says Gilbert Chlewicki, a Maryland engineer who first got the buzz started after presenting the idea at a California research conference in 2003. Traffic accidents fell 50% during the first six months at the inaugural interchange, largely because eliminating traditional left turns also eliminates those right-angle, T-bone crashes. (Engineer-speak for why these intersections have fewer accidents: limited "conflict points.") And a second diverging diamond built in Springfield has been well received. "It seems that you can get a lot more vehicles through the intersection in the same period of time," says Howard Jarvis, an emergency room doctor who drives through it on his daily commute. "Conceptually, it's different. But once you've been through it a few times, it's pretty intuitive." Only five diverging diamonds have been completed in the U.S. so far. (Missouri is leading the charge with three, Utah completed one in August and another opened in Tennessee last December.) But Saiko says he has fielded calls from interested engineers and consultants in 35 states, and at least 10 states are building or planning to build them. "They're going to be all over the place," says Bob Edwards, a public information officer for the Missouri transportation department. Popular Science named it one of the best innovations of the year in 2009, and the Federal Highway Administration featured it in a recent issue of Public Roads, their transportation-trends magazine. Why is a design used in Europe for decades only catching on in the U.S. now? It's perplexing in practice, at least at first, and confused drivers can be dangerous ones. While Missouri has reported no wrong-way crashes on its diverging diamonds, drivers have taken wrong turns toward oncoming traffic. Another obstacle is that some American drivers simply don't like the design, no matter how much engineers sing its praises. "The negative is usually, 'I think it's stupid. I don't like it,'" says Saiko. But as the idea catches on, and people become used to such interchanges, what was once exotic and confusing could become everyday and common. Meanwhile, Washington is paying close attention. "States ultimately make decisions about which type of interchanges they need," Federal Highway Administrator Victor Mendez tells TIME, "but the data are very clear that these work very well." This is an expanded version of a story that originally appeared in the February 7, 2011 print edition of TIME. See 50 essential travel tips. See pictures of Bangkok, the capital of gridlock.